REI will close for “Black Friday,” the day after Thanksgiving, the most important shopping day on the U.S. calendar. They want us to go outside and play. I LOVE this. “If only this would catch on,” was my first thought. And guess what: it has! According to King 5 News, Seattle retailers Outdoor Research, Gregory Packs, and Clif Bar, have Opted Outside now too. The #OptOutside movement speaks for itself, so I don’t feel the need to say more here. Except this: how about supporting the idea? Save our shopping urges for another day? 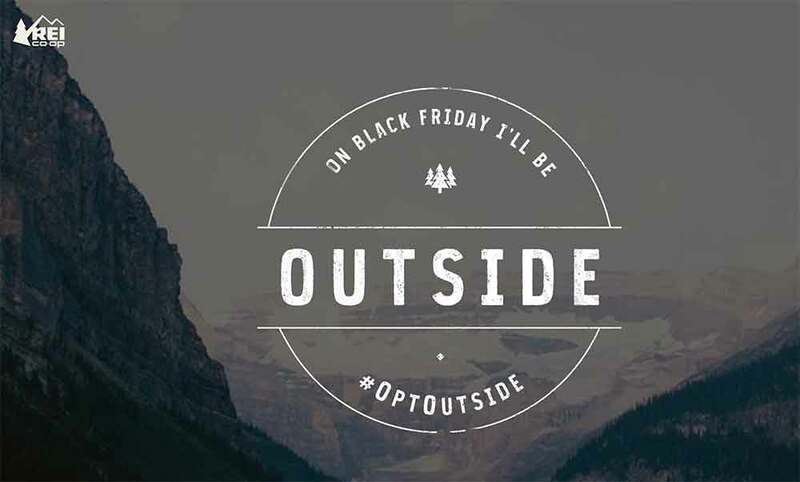 Anyone who can, let’s all go outside on Friday, November 27–anywhere outside, just nowhere near a mall– eating our Clif bars and wearing our REI gear proudly. This entry was posted in Wing's Words and tagged Black Friday, Clif Bar, OptOutside, outdoor gear, Outdoor Research, REI, shopping by gretchenwing. Bookmark the permalink. Totally love this idea! I have always hated Black Friday and avoided it like a plague! Now, I have something to do other than watch football! Look for my article about #optoutside on Tuesday at summitofcoin.com! Hopefully it will be warm enough for me to be on my bike, but I’ll probably have to settle for a hike in winter gear here in Michigan. But I’ll be nowhere near a mall, guaranteed!